Celebrated every September in Guaro, as well as other places throughout Andalucia. 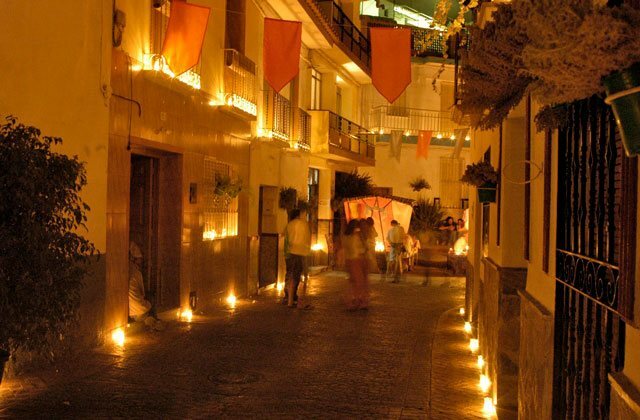 The Candle Festival represents the combination of Moorish, Jewish and Christian culture and traditions, which have formed The Andalucia we know today. The town is illuminated with approximately 25000 candles. A Moorish Souk Street Market, “Zoco de los Artesanos”, runs through the town, selling all kinds of oriental specialities: herbs, soaps, jewelry , lamps and more. The Food Trucks sell the most mouth watering food. Local bars and restaurants offer drinks and local cuisine at very reasonable prices. This is an evening not to be missed, normally taking place at the beginning of September. The event will be posted on the events page once full details of the festival are released. Previous Post:Teba, very historical with links to Scotland.